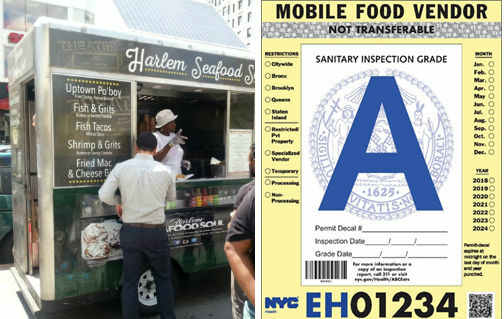 The Health Department today announced that the first letter grades have been issued to food carts and trucks. On the Lower East Side, Health Commissioner Dr. Oxiris Barbot congratulated Mahmoud Abdel Wahed, the owner of Mo’s Coffee Cart, which was among the first food carts in the city to receive an “A” grade. This past November, the Health Department published the final rules for the new grading program, which introduced a scoring system similar to the one used for restaurant inspections. The new grading program holds carts and trucks to the same food safety standards as restaurants. Food carts and trucks now receive points for violations, which correspond to either an “A,” “B,” or “C” letter grade. The new letter grading program applies to all food carts and trucks authorized to operate in New York City and is required under last year’s Local Law 108 sponsored by Council Member Karen Koslowitz. The letter grade is featured on the permit decal located on the cart or truck. It will take two years for the city’s more than 5,000 carts and trucks to receive grades, similar to the rollout of restaurant grading. “New Yorkers have a right to know that food carts meet uniform health standards, and it’s good news that the Health Department is implementing a letter grading system for food carts and trucks to help assure that those standards are met,” said Assembly Member Richard N. Gottfried, Chair of the Assembly Committee on Health. To help vendors understand the new grading system, the Health Department is distributing a self-inspection worksheet to help vendors monitor their own food safety practices. The Department is also hosting a series of free workshops about the new grading program for vendors. To date, over 300 vendors attended the workshops, which were presented in English, Spanish, Bengali, Arabic, and American Sign Language. Upcoming workshop dates and locations are posted on the Health Department’s website at nyc.gov/health/mobile food. The expansion of letter grading allows the Health Department to make penalty schedules for scored and unscored violations and fine reductions for food carts and trucks consistent with restaurants. The policy will result in a reduction in fines for food cart or truck owners. Now if a food cart or truck earns an “A” grade at the time of inspection, fines imposed for food safety violations will be eliminated. The Health Department began issuing letter grades to restaurants in July 2010. Currently, more than 90 percent of restaurants post “A” grades – and a similar percentage of New Yorkers approve of restaurant grading and use letter grades to make dining decisions. Photo credit: Harlem Seafood Soul and Grade sheet. This entry was posted in Food, Harlem, Harlem to Hollis and tagged Abdel Wahed, Dr. Oxiris Barbot, Harlem to Hollis, Health Department, Karen Koslowitz, Mahmoud Abdel Wahed, Mo’s Coffee Cart by Harlem World Magazine. Bookmark the permalink.